There’s a new ingredient which is already hugely popular in Australia and is making its name in the beauty industry as the new wonder ingredient which can be found in anti-aging serums, creams, sun care, after-sun care, face and hair masks, as well as shampoo and conditioners. Kakadu Plum, an Australian fruit, also called Gubinge, Billygoat or Murunga, contains the highest concentration of Vitamin C of most fruits – and 100 times higher than oranges. Kakadu plum is similar to a gooseberry, yellow-green in color and about the size of an almond. Aborigines have lived in the Kakadu park area for tens of thousands of years. As nutrient-rich fruits, Kakadu plums have been a traditional source of bush tucker for people during long treks or hunting trips. It was also traditionally pounded and used as an antiseptic and a soothing balm for aching limbs. Kakadu Plum is one of the key ingredients in Eviternity 20% Vitamin C & Hyaluronic Acid Age Defence Tropical Super Serum - expertly formulated to help reduce the appearance of fine lines, wrinkles, age spots and dull, tired looking skin. Extracted from Kakadu plum, the world’s highest source of Vitamin C.
Kakadu plum is a unique super fruit known as the world’s richest source of vitamin c.
It reinforces cell antioxidant defences to better protect against oxidative stress. Stimulates the expression of SVCT-I, the vitamin C transporter of the skin. By inducing the SVCT-I channel expression, Superox-C™ contributes to improve the penetration of vitamin C into the skin. Superox-C™ strengthens the skin matrix and is proven effective in instantly brightening the skin and enhancing its radiance. STAY-C® 50 is a powerful in-vivo antioxidant and free radical scavenger which works to help improve skin tone and texture. It reduces the appearance of skin blemishes and acne, not only experienced by teenagers, but also by adults. It also stimulates the production of collagen and helps increase skin firmness. The antioxidants in this nutrient-packed fruit can help reduce the appearance of fine lines and wrinkles and boost collagen production due to the fruit’s potent amount of Vitamin C. The gallic acid in the Kakadu plum also works as an astringent against bacteria. The fruit’s extract of Vitamins C and E along with carotenoids and folic acid can help reduce puffiness and dark circles under the eyes. These nutrients reverse the properties of free radicals and therefore lessen the appearance of aging skin. Kakadu Plum extract can be effective in reducing the appearance of dark spots, improving skin discoloration and restoring the skin’s natural, even tone. The main cause of dark spots, also known as age spots or “liver spots, is exposure to the sun’s ultraviolet (UV) light. UV rays stimulate the production of melanin, a substance that gives color to the skin. When you are over-exposed to UV rays, melanin accumulates in certain areas and in higher concentration this can contribute to dark spots. Vitamin C helps protect the skin from UV damage due to its antioxidant properties. Antioxidants fight the effects of dangerous molecules known as free radicals which are harmful to body tissue and skin. Daily aggravators include; sun exposure, pollution, cigarette smoke and stress. 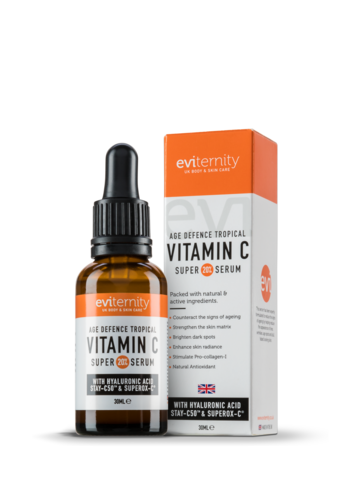 The new Eviternity 20% Vitamin C & Hyaluronic Acid Age Defence Tropical Super Serum is available to buy £14.99 from http://eviternity.co.uk/ and Amazon. This press release was distributed by ResponseSource Press Release Wire on behalf of Terenia Taras PR in the following categories: Health, Women's Interest & Beauty, Retail & Fashion, for more information visit https://pressreleasewire.responsesource.com/about.